I feel that many people, both enthusiasts and casual fans, hope that the worldwide success of Persona 5, a game that has been worshiped by players in and out of Japan, will be able to bring Japanese role playing games back into the mainstream. The popularity of the genre has declined dramatically in recent years, during which time the market was invaded by new RPGs developed in the West. On top of that, talented RPG studios actually made Western-themed games like Dark Souls and Dragon’s Dogma. After an unsuccessful attempt with Undead & Undressed, Akiba’s Beat’s brand returns to scenes with a more canonical title, which seems to want to exploit the success of Persona to conquer new audiences. Well, to begin with, we don’t get anything nearly as interesting as the unique and memorable characters from the Persona series. Instead we get Asahi, the protagonist of Akiba’s Beat, who is given a lengthy introduction during the early hours of play. We learn that he’s a NEET, a term that refers to people who are not studying, do not work and are not even undergoing apprenticeships. While Akiba’s Beat likely makes this decision to make its protagonist more relatable and perhaps even more modern way of defining the odds, they seem to neglect the fact that many young people today are in this situation not by their own choice. Akiba’s Beat seems to ignore this type of character development, favoring a protagonist who is careless and lazy, whose only interests appear to be video games, manga and sleep until the afternoon. Beyond the very boring details of Asahi’s life, however, the plot and the characters manage to form a narrative at the core of the latest Akiba effort that is surprisingly original. It’s a blend that’s formed by mixing ideas, stereotypes and narrative tropes. In this regard, the main source of inspiration, if we want to call it inspiration, is surely the Person’s saga, specifically the recent fifth chapter. There are also nods to other stories that feature cyclical repetition of the same time segment (Edge of Tomorrow and Groundhog Day) as well as tropes about a rift between the real dimension and the dream dimension. Younger players (and those who know a bit …) will find probably be entertained by the tide of references to otaku culture, to video games, and to everything that is nowadays called “nerdy”. More seasoned players will probably find it tedious because of the excessive verbosity of the protagonists, the overexposure of story and the repetition of many dialogues, which strike as a hammer on points already abundantly clear even to less careful players. Asahi ends up making friends with a bunch of stereotypical characters that include: a tender-looking, long-spoken introvert, a couple of insecure pre-teenagers with hidden talents, and a shy student who just moved to Akihabara. Asahi and his team, therefore, do not shine for sure in terms of originality and uniqueness. However, up to the first fifty or so hours needed to see one of the final endings, an empathic bond will be created with these characters that is discreet but not that compelling. I do not think it’s wrong to say that Akiba’s Beat’s playing mechanics are a mix of two of the most beloved series of turn-based combat in JRPG video game history: Namco’s Tales and Atlus Persona series. There’s no shame in reusing concepts and dynamics from the best players in the genre: the problem, rather, is to do so badly, transforming the tribute into an ugly mess. Unfortunately, this is precisely the case of Akiba’s Beat, which tries to blend the exploration, setting and narrative part of Shoji Meguro’s titles unsuccessfully while copying the combat system that has made famous Bandai’s series over the years, without adding anything that can distinguish it, and, in addition, without taking the best of the aforementioned titles. It seems limited to a mild imitation of mechanics, does not hold the same care for the details and accuracy of the controls. The game stages outside the dungeons, here called Delusionscapes, clearly echo games from the Shin Megami Tensa series. As for the setting, Akihabara, it feels anonymous and impersonal, as it’s empty and full of invisible walls. You interact with the small handful of NPCs present to continue the plot, obtaining secondary missions from time to time which are often linked to members of the recruiting party. These sections lack the feeling of moving in a pulsating city, which is alive with dozens of things to do. It is true that after Persona 5 (reviewed by Nazih Fares back in April), any RPG that is directly compared would do poorly. But even if we avoid comparing Akiba’s Beat to its obvious source of inspiration, beyond that, the game never succeeds in amazing, immersing, or surprising the player. Instead, it drags between the dungeons and the NPC sections to the rhythm of prolonged and sophisticated dialogues. Once inside the combat areas, things don’t improve. They’ve gone for a frantic battle system, which is an idea that worked really well for other JRPGS. In their case it features real-time attacks, parrying, and dodging, with the option of holding L1 to move freely in three dimensions. However, the development team hasn’t managed to include the same command responsiveness and speed. Fights with common enemies are over in seconds thanks to button mashing, and those with bosses starting from the second dungeon extend for several minutes but never really pose a threat. You do need to recharge action points, and there’s a lot of slowness in the response to the commands, but all this does is slow things down. The special moves very unattractive both in performance and in effects. The dungeon design is honestky very weak and the enemy variety is significantly lacking surprise. Visually, the game is no treat either, and it lags far behind the PS4 standard. At the end of my playthrough with Akiba’s Beat, I felt like I had approached something interesting, but I had never made contact. 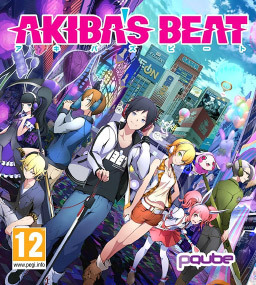 Akiba’s Beat was reviewed using a PlayStation 4 digital code of the game provided by PQube. The game is also available on PlayStation Vita via retail and online stores. We don’t discuss review scores with publishers or developers prior to the review being published.